All reasoning begins with Assumptions. When we think, we must assume certain things to be true without any real proof that they are. We build our thinking upon Assumptions. It is important to remember that Point of View also includes Assumptions, but those Assumptions are about world view. Here, in the Elements of Thought, we look at Assumptions as beliefs upon which we base the logic of what is being reasoned about. 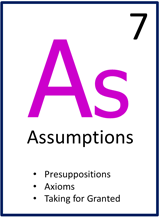 Assumptions can be Presuppositions, what we accept without proof but believe to be true. They are the “let’s suppose that” statements that are taken to be fact. Assumptions are also Axioms, what is self-evidently true and does not need to be proved. What is obviously the case can be the basis for solid reasoning. What we are Take for Granted are educated guesses about reality, what we believe is the case but we cannot verify. However, we must consciously decide what we are going to take for granted. Don’t make an assumption because it is easy or not thought out. When we think critically, we can start from Assumptions and move to what we know for sure (deductive reasoning) or we can start from what we know and move to Assumptions (inductive reasoning). When Assumptions are proven to be true, then they become Information. Assumptions are what we presume without evidence. The stronger the Assumptions, the stronger the thinking.